The Missouri Fox Trotting Horse Breed Association released the ballot for the upcoming election. In the next several weeks, candidate biographies will be added to this announcement as they become available to assist MFTHBA members in learning more about the nominees. All individuals listed as a member in good standing as of July 1, 2018 are eligible to vote. Ballots will be mailed mid-August. 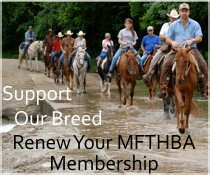 Members not receiving a ballot by September 1 should contact the MFTHBA office either by email foxtrot@mthba.com or text 417-250-0654 to request a new ballot. Be sure to include your name, member number and current address. Results will be announced mid-October.